Funding: No funding was received for the preparation of this letter. Disclosures: The authors have no conflicts of interest relevant to the content of this letter. Squamous cell carcinoma (SCC) is the second-most common skin cancer following basal cell carcinoma. It has a predilection for sun exposed areas of the body but it may also occur in areas of chronic scarring and ulceration. 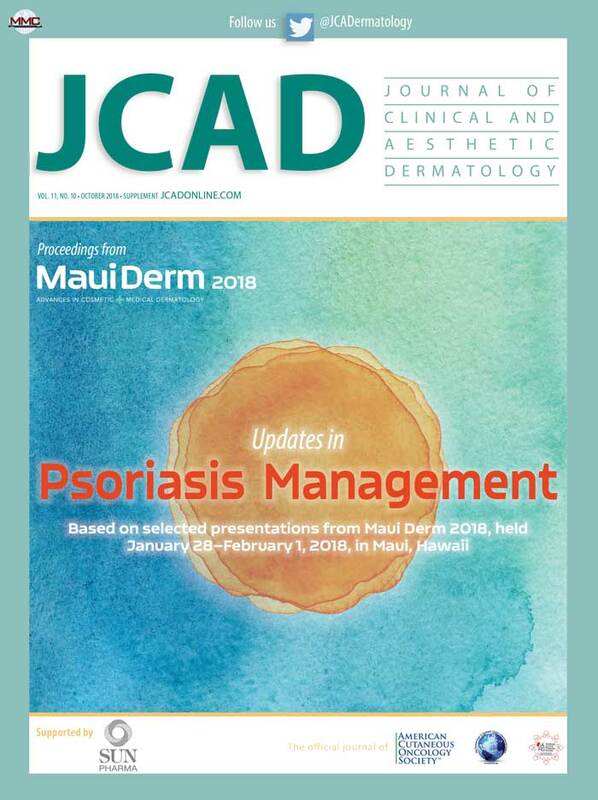 Actinic keratoses (AK) are considered premalignant lesions that might progress to SCCs and should always be treated promptly. Ingenol mebutate is a novel approved treatment for AKs, thereby preventing their possible malignant transformation. 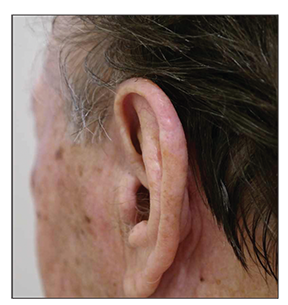 We present a patient with a SCC on his left ear that was treated with topical ingenol mebutate. Case report. 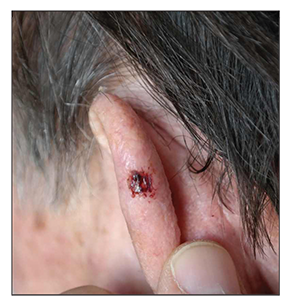 A 75-year-old man with solar elastosis and numerous AKs on the face and scalp presented to our clinic in November of 2015 with a persistent ulcer of 5mm in diameter on the helix of his left ear (Figure 1). According to his history, the lesion developed four months before examination and slowly enlarged. Laboratory investigation including gram stains and cultures obtained from the ulcer were negative. We performed a 2mm-punch biopsy of the lesion, and histological examination revealed the presence of an intraepidermal SCC. The patient did not consent to surgical excision of the lesion and was scheduled for cryosurgery after two months. We prescribed Iingenol mebutate 0.015% gel once daily for three consecutive days for his AKs. At the scheduled follow-up in February of 2016, all of the AK lesions, including the SCC, had completely resolved (Figure 2). The patient simply stated that he had also applied ingenol mebutate to the SCC on his own using the same prescribed regimen. 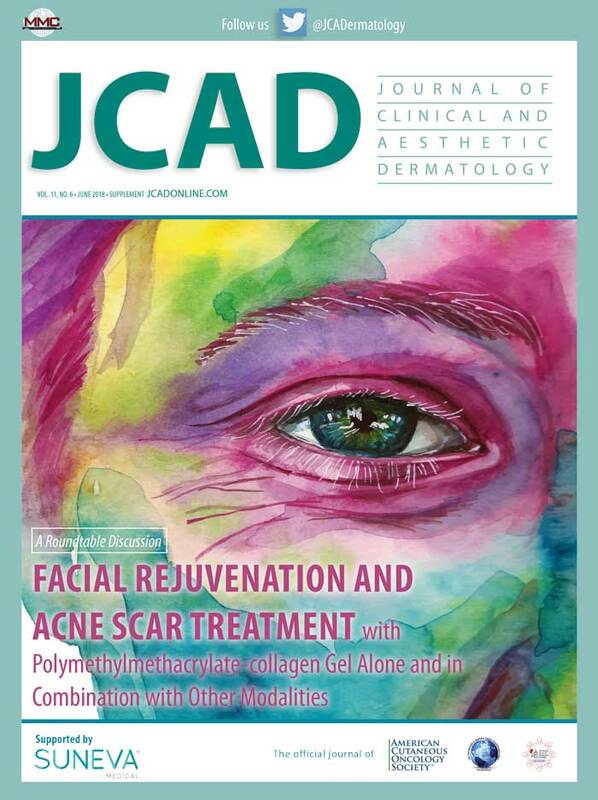 On a follow-up visit in May of 2016, five months after the application of the ingenol mebutate cream, no recurrence was seen. Ingenol mebutate is a relatively new therapy for the management of AKs. Common side effects include erythema, swelling, irritation, crusting, itching, and pain or burning sensation at the sites of application. Eye or eyelid, nose or throat irritation, headache can also occur. 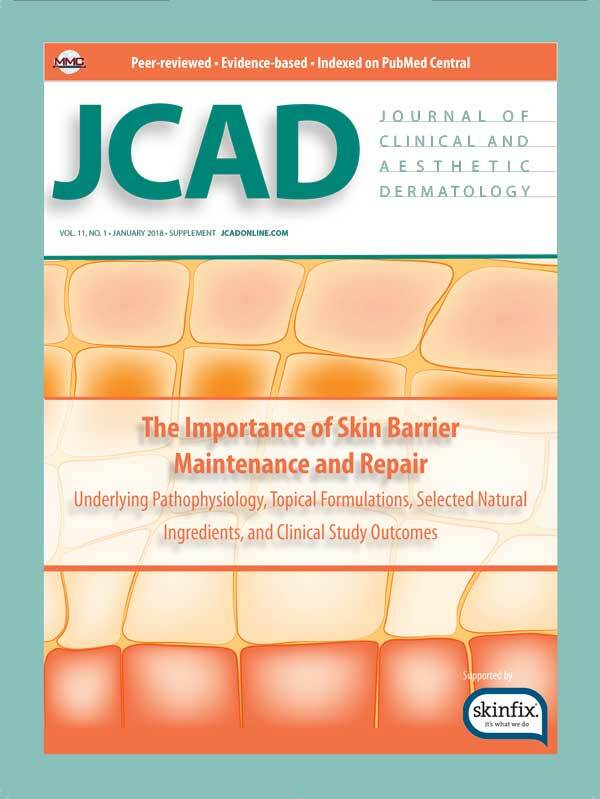 Recently, an erosive pustular dermatosis of the scalp induced by ingenol mebutate was reported. A Phase I/II clinical study aiming to determine the effectiveness of ingenol mebutate on nonmelanoma skin cancers (NMSC) demonstrated a 75-percent complete clinical response rate in SCCs after one month, which declined to 50 percent after a 15-month follow-up. 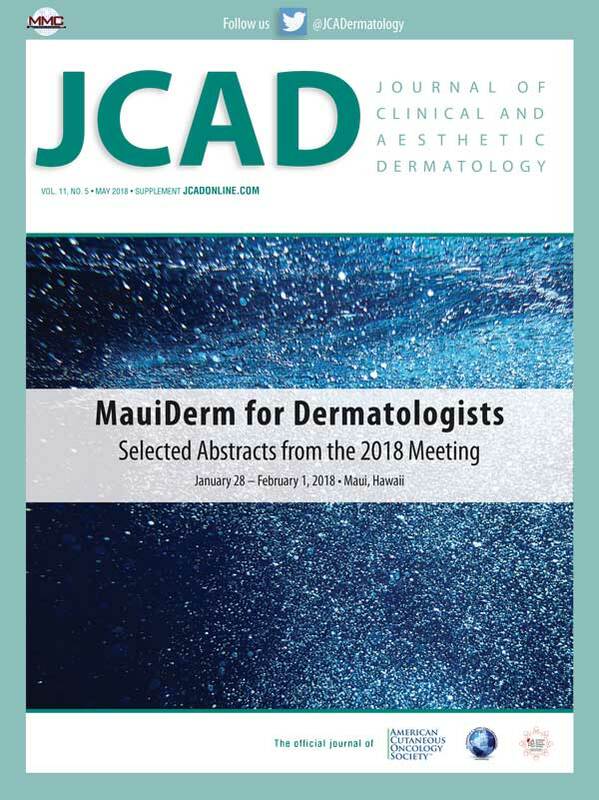 Even though only a small number of patients with SCCs (n=4) was included in this study, the remission rates for other NMSCs, including BCCs and intraepidermal carcinomas, were encouraging. In wild type mice with ultraviolet (UV)-induced SCCs, treatment with ingenol mebutate has also shown to be efficacious. The medication’s mechanism of action described by investigators was disruption of tumor cell mitochondria and primary necrosis-induced tumor cell death. Mobilization of an innate and adaptive immune system was implicated, with activation of SCC-specific CD4 T cells. The ingenol mebutate concentration in the gel (0.25%) that was used in this study, however, was higher than the 0.015% or even 0.05% that is used for AK treatment in humans. There is a report of two cases of AKs treated with ingenol mebutate in which the patients developed rapidly growing SCCs. The authors hypothesized that the inflammatory process induced by ingenol mebutate along with a possible genetic susceptibility triggered a paradoxical rapid malignant transformation to SCCs. Current literature and our experience suggests a curative effect of ingenol mebutate in SCCs. On the grounds of the unknown mechanism of action of ingenol mebutate, it is obvious that further studies and more clinical experience are needed to assess the true potentialities of this medication. Rallis E, Stavropoulos PG, Papafragkaki DK, Katsarou-Katsari A, Avgerinou G. Squamous cell carcinoma developed on Kyrle’s disease scar. J BUON. 2014:19:317–318. 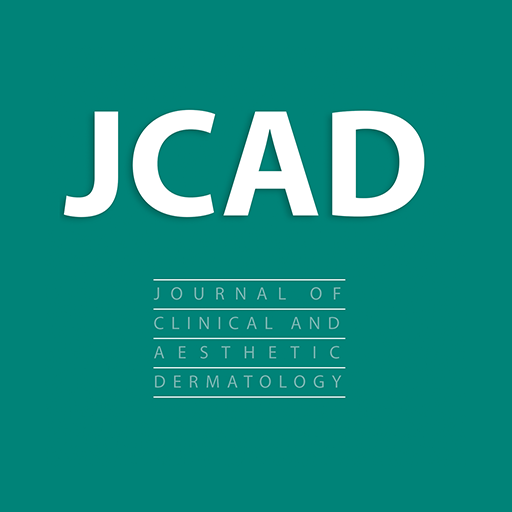 Aditya S, Gupta S. Ingenol mebutate: A novel topical drug for actinic keratosis. Indian Dermatol Online J. 2013;4:246–249. Ramsay JR, Suhrbier A, Aylward JH, et al. The sap from Euphorbia peplus is effective against human nonmelanoma skin cancers. Br J Dermatol. 2011;164:633–636. Cozzi SJ, Le TT, Ogbourne SM, James C, Suhrbier A. Effective treatment of squamous cell carcinomas with ingenol mebutate gel in immunologically intact SKH1 mice. Arch Dermatol Res. 2013;305:79–83. 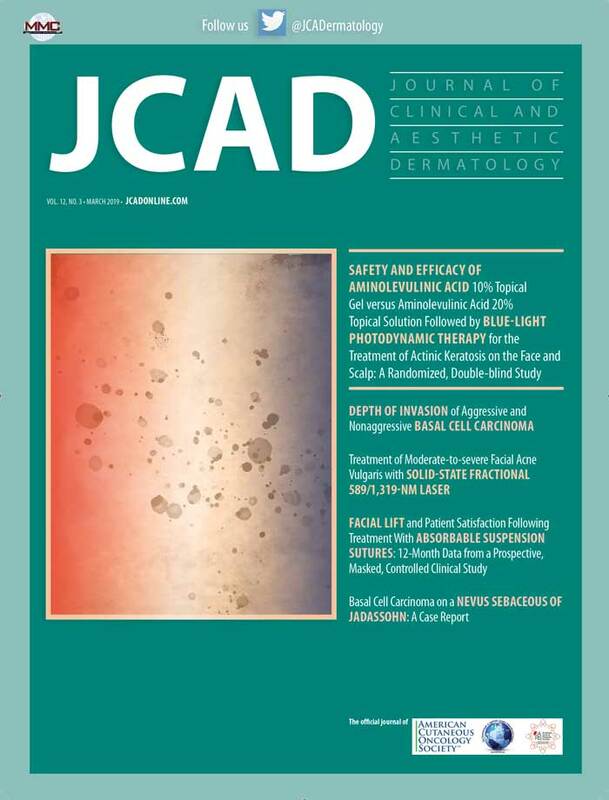 Moreno Romero JA, Campoy A, Perez N, Garcia F, Grimalt R. Rapidly-growing squamous cell carcinoma shortly after treatment with ingenol mebutate for actinic keratoses: report of two cases. Br J Dermatol. 2015;173:1514.